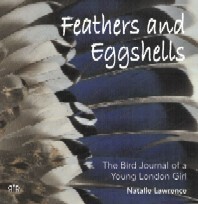 This is a jewel of a book, the kind of small volume that all bird lovers will surely wish to own, indeed treasure. It reveals a wealth of beautiful things, and as such, is an inspiration for young and old alike. Hampstead Heath is the largest open space near to where I live. Since the age of about five, it has always been one of my favourite places and I have spent many hours exploring it... As I got to explore nature, I began to understand how it was possible to miss the most extraordinary layers of life all around us, often hidden. As you start to explore, a different world comes to light, like the depths of a pool suddenly revealed by a shadow, where before only a bright reflection could be seen. ...My earliest memories of the Heath are of spending ages by the water's edge, mesmerised watching the ducks, coots and swans. I think that the water birds are definitely the birds that people visiting the Heath remember. Recently, I saw a group of Great Crested Grebes with a striped juvenile. It no longer had its baby fluff but was not yet in full adult plumage. The juvenile, aimlessly paddling around like a gormless adolescent and sometimes attempting to dive, kept getting chased off by pugnacious coots. ...Nuthatches and treecreppers are some of the most reclusive birds on the Heath. Unfortunately, I have only seen each of these species a few times, but they are lovely.The surprising dexterity with which a nuthatch can climb up and down tree trunks, even upside-down, is fascinating to watch. Treecreepers also spend their time on tree trunks, but they cannot descend, and so always move upwards in a spiralling motion, using their stiffened tail feathers as props. ...Apart from a couple of other species, the carrion-feeding and raptorial birds are the only species that prey on live mammals and birds: the Kestrel and Tawny Owl take small rodents whilst the Sparrowhawk hunts small birds such as Sparrows and Robins, and the crows feed off practically anything.